A highly sensitive magnetic particle powder, 14A fluorescent mag particles are engineered to locate very fine discontinuities in critical parts and applications. 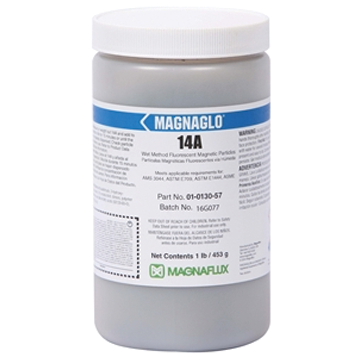 Designed with strong fluorescent properties, 14A magnetic powder is made with a carefully optimized range of particle sizes & shapes to ensure particles move quickly and easily to indications, while minimizing background and particle clumping. The result is faster inspections with better reliability and greater confidence. A great choice for inspecting machined parts, welded parts, after secondary processing, critical in-service inspections and testing smooth surface finishes to find inclusions, seams, shrink cracks, tears, laps, flakes and cracks. 14A particles meet all major industry and NDT specification requirements, including Aerospace, ASTM and ISO 9934.